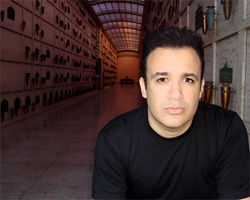 Carlos Ferro is one of the leading voice acting talents working in the industry today. A star of the award-winning, best-selling GEARS OF WAR and GEARS OF WAR 2, Ferro is known to video game fans worldwide as the voice of COG soldier Dom Santiago. In addition to his work on GEARS, he is also known as the voice of Michael Corleone, head of the Corleone family in THE GODFATHER II and Leonardo da Vinci in ASSASSIN"S CREED 2. Ferro has lent his voice to such well-known properties as JUSTICE LEAGUE, SPAWN, REIGN: THE CONQUERER, X-MEN: NEXT DIMENSION, TONY HAWK'S AMERICAN WASTELAND, SCARFACE: THE WORLD IS YOURS, QUANTUM OF SOLACE, INDIANA JONES AND THE STAFF OF KINGS as well as the popular SAINTS ROW and UNCHARTED franchises. Anime fans know him as the evil Thomas Waltham from GOLGO 13: QUEEN BEE. Ferro is also an accomplished actor and has starred in landmark television shows such as STAR TREK: THE NEXT GENERATION.